We know that new forms of business models and partnership are required to realise the potential of shared-value business opportunities. 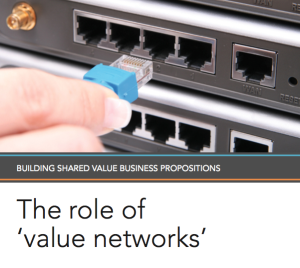 TNP has been able to provide some of the lessons from it’s work on the creation and scaling of shared value products and services that deliver commercial and social return in a new article The Role of Value Networks. Shared value explores the incorporation of social importance in value propositions as a means to support the bottom line. This approach focuses on the re-design of core business lines to include and deliver targeted social impacts as a strategy for greater market penetration, market share, and competitive advantage, in addition to legitimacy benefits.